It’s been 12 years since the young band of virtuosic players known as Punch Brothers first gathered early in their careers. Together, they have grown up in the industry, developing a deeper, more mature sound as a quintet, while each of them expanded their multifaceted individual careers. 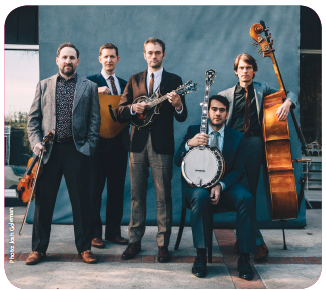 Today, each of the Nashville Local 257 members remains steadfast in his dedication to Punch Brothers, which released its fifth studio album, All Ashore, in July. Their first self-produced album is a nine-movement suite of interconnected themes and stories. In 2006 mandolinist Chris Thile first gathered the group of like-minded 20-something instrumentalists—Eldridge (guitar), Gabe Witcher (fiddle), Noam Pikelny (banjo), and the band’s original bassist Greg Garrison—specifically to complete his project coined The Blind Leaving the Blind. The Blind Leaving the Blind, Thile’s four-movement, 40-minute suite for bluegrass instruments debuted in 2007 at Carnegie Hall. Punch, the group’s first album on Nonesuch Records, featured the suite and other original songs from the quintet. Four more albums, two EPs, and multiple tours have followed for the bluegrass-influenced group that defies genre definition. As the group has evolved, so has each of its members’ solo careers. Garrison left after the first album and was replaced by the band’s youngest member, Paul Kowert. He describes Chris Thile, as “one of the most brilliant musicians on the planet. He has an incredible ability to mastermind the architecture of music.” A mandolin prodigy, Thile co-founded the acoustic trio Nickel Creek as a child. He made his first solo album at 13, following in the steps of progressive bluegrass players like Béla Fleck and Edgar Meyer, both members of Local 257. Thile was IBMA Mandolin Player of the Year in 2001, at age 20, and a MacArthur Fellow at 31. In 2016 Thile took over hosting duties for Live from Here (formerly A Prairie Home Companion). He released Thanks for Listening, a collection of songs written for the program in 2017. Fiddler Gabe Witcher performed in his family’s band as a youngster. He first jammed with Thile after meeting as children at a bluegrass festival. He is an accomplished producer who took much of the lead in producing All Ashore. He also produced Grammy-nominated albums for Eldridge and Pikelny. “Noam [Pikelny] is so ingenious at coming up with incredible textures on his instrument,” says Eldridge. “He can play so sensitively—like the world’s most lyrical banjo player. He has such an intelligent and beautiful sense of curiosity about the instrument and an incredible work ethic.” Noam’s fourth album Universal Favorite (2017) was nominated for a Grammy and he was IBMA Banjo Player of the Year in 2014 and 2017.